Having grown up in the Rust Belt (northeastern Ohio), this month's choice of Detroit coincided nicely with my renewed interest in sketching/painting. So...once again, I logged in and began to wander the streets. 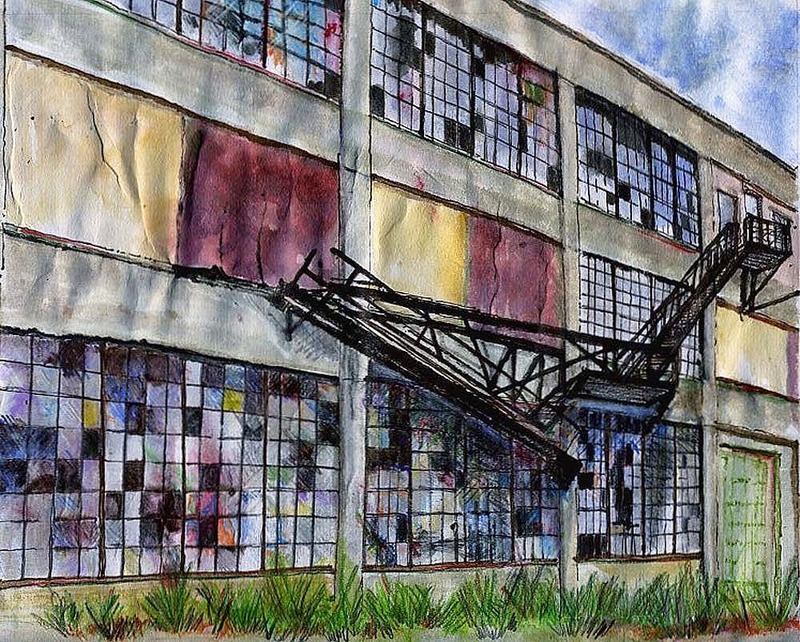 I had remembered reading about the Packard factory on David Byrne's personal online journal (He has an excellent section with his impressions and thoughts about Detroit) and was surprised to discover that I could get up close enough to it on StreetView to get the kind of composition I was looking for. 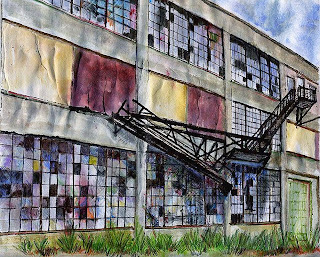 It's a huge automotive plant-built in 1903-that was abandoned in the 1950's after the once fabled Packard luxury automobile lost its appeal through mis-guided mergers, economic conditions, and regrettable design and business decisions. To me, it is the quintessential poster child for the decline of the northern industrial cities of America. So...greetings to all of my fellow participants. It's good to be back. It's a great piece of art. I really enjoy seeing industrial ugliness transformed into artistic beauty. Nice work. I love the colors in the old windows. Welcome back! I hope to see an entry from you next month, as well. Can't wait to see where we'll be going. Morphing montage of 500yrs. of female portraiture: incredible. Chris Bliss juggles to Beatles song: fantastic. Autistic Artist draws Rome from memory: amazing. This is a Flickr badge showing public photos from Rah Kyndl. Make your own badge here.